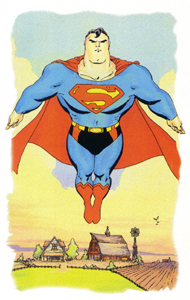 One of the things that I wanted to capture with this story was the grandeur that is Superman. In order to do this, I felt that we needed to do a lot of double-page spreads, a lot of big sky shots. I had already worked with the illustrator, Tim Sale, and he found Bjarne Hansen, who painted the colors. Tim explained to Bjarne exactly what we wanted. And when Bjarne colored the first few pages of the story, everyone's mouths - including my own - hit the floor. Tim very often left a great deal of space open for the color, and, since it's very difficult to imagine what the color on a pencil and ink drawing is going to look like, when the pages were still uncolored they looked very sparse. 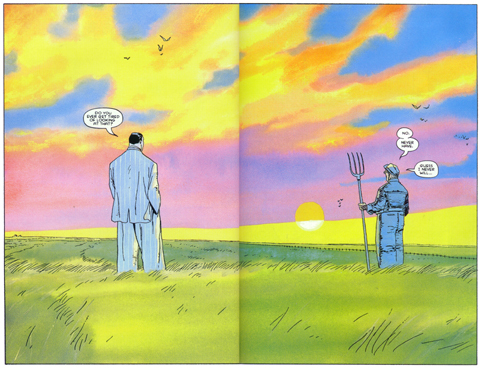 For example, we always knew that when Clark left Smallville at the end of the first chapter, Pa Kent was going to be out in the field, and they were going to be looking at a sunset. Tim had drawn two characters in the foreground, a little bit of grass, and a line across the horizon, and sent it in. And of course, I had the audacity to write Clark saying, "Do you ever get tired of looking at that?" and Pa replying, "Nope. Never have, never will." And that was it! When DC saw that, they said, "Where's the rest of the page?" The rest of the page was Bjarne Hansen. It's a wonderful, magical moment, just like Tim knew that it was going to be. Once we saw that, it gave us the confidence to go on to the second and third and fourth chapters and really have fun and play it out. I particularly liked the Luthor chapter, which was always my favorite until people started reading the story and talking to me about it. Then the first chapter became more important. But the third chapter, where Bjarne essentially changed his palette, became darker without Tim having to go darker, without Tim having to close up the spaces. It was one of those situations where it was either going to work or it wasn't going to work; there was no middle ground. We're very lucky that it worked and that people responded favorably to it. Originally, I never intended to have a narrator. I also knew that I didn't want to do the story from Superman's point of view. I didn't feel comfortable being inside the head of an icon. I couldn't even do it as Clark, separating the voice so that you would only know what the human side was thinking about, as opposed to the superhuman side. I wrote the script for the first chapter after Tim had drawn it. Now, I generally describe each panel on a page-by-page basis, and give little flecks of dialogue along the way so that whomever I'm working with knows whether or not an expression should be sad or happy or fun or whatever, based upon the dialogue. I finished the script for the first chapter, read it over, and was absolutely convinced that, aside from the fact that nothing happened during the story and that Superman didn't appear until the very end, the fact that it was such a light read needed to be dealt with. I went through many different ideas as to who ought to narrate it, and was pretty set on Clark. But when I thought of the scene where Martha is standing on the porch, I tried it with Pa talking about his memories of what Clark was like as a baby. These were memories that I had of what my son was like as a baby. I suddenly found a voice, and to this day I still think that it's some of the best stuff that I've written. Once that happened, I was faced with a problem - I couldn't have Pa Kent narrate the second chapter, because it all took place in Metropolis. Suddenly the idea of having Lois narrate the chapter came to mind, and then, at that point, I wrote the plots for the third and fourth chapters with Luthor and Lana in mind. But it is sort-of curious to me when I go back and look at my original plots for the first and second chapters, how the stories were not geared around having anything other than a third-person narrator, yet how easily Pa and Lois fit into those stories. It's one of those things that just happened along the way, and boy am I glad that I tried it.